Doctors have warned tourists and party-goers of the danger of “deadly stamps”, as the illicit drug is becoming popular among nightlife visitors to Koh Pha-Ngan. 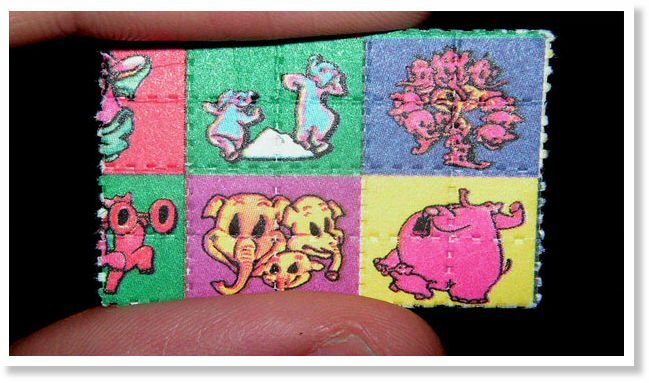 Characterised by its resemblance to a stamp, the drug, which contains lysergic acid diethylamide (LSD), can lead to severe hallucinations, violence, self-harm and suicide, doctors at the Public Health Ministry said on Tuesday. The drug takes effect 30 to 90 minutes after users put the tiny piece of LSD-coated paper under the tongue, but the effects last between eight and 12 hours, Medical Science Department director-general Somsak Akksilp said, following the recent arrest of a German drug dealer who had been selling the “deadly stamps” to tourists on Pha-Ngan Island. The drug causes dilated pupils and increases body temperature and heart rates, and it can also cause sweating, lack of appetite, insomnia, dry lips and shaky hands, he warned. Under its influence, people may at first feel happy and energetic, but that is followed by severe hallucination, which can to lead acts of violence, self-harm and suicide, he stressed. LSD, also known as “acid”, can also affect mental health in the long run, leading to psychiatric disorders, depression, paranoia and hallucination long after users stop taking the substance, said Sarawut Boonchaipanichwattana, director of the Public Health Ministry’s Princess Mother National Institute on Drug Abuse Treatment.